Today was an unusual day for Blizzard, after taking care of his normal duties he had started work on a new cavern for the palace. Being careful as normal he took his time slowly carving into the ice, since the icewings have expanded in size recently new quarters had to be made. So under orders from the leaders he was chosen to start work. A few moments later he heard some voices outside, he went to go investigate and wondered if there was a problem. Walking back into the hall he saw several Icewings grouped up, he thought to himself 'Maybe the scouts have spotted something' as he walked up he nodded awaiting someone to respond. Frostflare, as usual, quickly finished her duties and all what was needed to be done was give out some commands, and hunt food. She started at her two eggs that she had in her nest and shouted. "AHH THEY'RE DEAD! I knew I shouldn't have gotten a mate. I don't even know where he went." She siged, then walked out of her cave. SnowFall looked outside her window from her palace. It was all white and filled with snow. She then remembered that she had to give out duties to people and hunt for the tribe. Telling a few gaurdians to go gaurd the border she left the palace, and went to go hunt. Tracker jobs were the easiest for Snow. She returned within minutes holding a deer and an elk. The queen placed it onto the pile of food and left to go see and wander around the palace. She stumbled upon Blizzard, her younger brother who had joined the IceWings and was chosen the rank as Vulcan. Giving him a slight nudge for greeting, Snow said to him, "Hello Blizzard. How are you?" She glanced into the den that Blizz was looking at to see Snow's leader friend. Then she saw the eggs who were dead. Snow gasped, "Frostflare! How'd you take care of those eggs? Anyways, are you alright? And, where exactly is your mate?" SnowFall was shocked to see the dead eggs and was sad that the hatchlings didn't have a life. Frostbite padded into the room, bouncing happily along. She had seen her siblings Blizzard and Snowfall going into Frostflare's room, so she had come to see what was going on. "Yo," she said cheerfully, before staring quizzically at Frostflare's grief-stricken face. "What's wrong......" she trailed off when she saw the broken eggs. "Oh," she said softly. "I see. I'm sorry for your loss, Frostflare. Who was your mate?" Glacier was coming back from a successful hunt, flying straight towards the palace of ice. He was carrying a big deer between his claws, a fresh and succulent prey. The other tribe members will certainly be happy about it. Glacier suddenly heard someone shouting. He turned towards the direction of the scream, worried. The shout came from the lair of FrostFlare, one of the icewings leaders. He hoped there were no dangers. Glacier changed direction to quickly fly towards Frost's lair. He realized there were other ice dragons, practically the entire tribe. Glacier landed near the lair, temporarily letting go the grip on his captured prey. "Hey, what's going on?" He asked worriedly, his eyes pointed toward the den. With so many dragons around it was difficult to look inside. Glacier, however, decided to step back and remain at a safe distance, preferring to don't take too much the attention, not being a very social dragon. FRostflare snapped at the other dragons. "It doesn't matter they're dead! Why did I even think about having hatchlings? I wish I never met Sorin! I hardly ever even see him! I was so stupid!" She shouted once agian and bashed her head against the wall. She looked down at her eggs then flipped the nest. She starred at it as the eggs flew into the soft snow. Blizzard was shocked at Frostflare's response, he frowned feeling sorry for her. He wanted to speak to try and comfort her, but hes nerves where getting at him, especially with all the other dragons close by. "I'am sorry Frost...." he spoke quietly and softly, but paused frowning lowering his head. 'Gahh.. why can't I talk up...' he thought to himself sighing feeling disappointed with himself. Frostflare was very uncomfortable with all of the dragons around. She wanted to be alone. "GO AWAY!" She shouted to the dragons before flying off and out of the cave, vanishing into the distance. She got rid of one problem, but it didn't change the fact that two eggs just died, due to a selfidh mother who didn't care, or at least that's what Frostflare thought of herself as. SnowFall was surprised at Frostflare's response. She had expected her to be a bit sad about the hatchlings. It had turned out to be the opposite. As Frost flew away, Snow too left the group. She had to find her leader friend to talk with her. As she landed to a nearby tree, Snow followed. At last they stopped and she talked to Frostflare, "Hello Frost. Are you okay? Were you upset over your loss? Or were there too many people crowding around you and made you feel nervous?" Snow wanted to make her friend feel better. She hated when people were sad in the tribe. Frostflare looked over at the other queen. She spoke to her in a tone of voice that screamed out her pain. "What do you think? I just killed to hatchlings because I didn't take care of them. I'm a horrible mother. What eggs stay eggs for almost a whole year. They're dead they have to be! And it's all because of me. What do I do Snowfall? I just killed two dragons! Help me!" At this point she was just so confuzed and heart broken she didn't know what to do. Frostflare was shutting down. All of her senses weakened, her vison got blurry, and she started shaking rapidly. She tried to stand up, but then wobbled as she then colapsed into the snow. Right when her body hit the ground she fell into a dream, no, a nightmare. In her dream, she woke up in a place completly of darkness. She shouted out at the top of her lungs. "WHERE AM I?" as she heard a cracking sound. She looked down and saw the thin lair of ice that was the ground. Frightened, she unintentionally jumped back and caused the ice to shatter, making her fall down deep into an aybuss. She landed in a room full of mirrors, but yet none of them held her reflection. Frostflare whispered to herself. "What's going on..."
As he saw the two leaders leaving the palace he chose to follow but to keep his distance, he didn't want to rudely interrupt them. Shortly after he saw Frost collapse he dashed towards both dragons, glancing towards snow "What happened?" he asked turning his attention back to the fainted frost. "Frost?? can you hear me?" he spoke with a gentle voice, softly poking her with his snout. In Frostflare's dream, she herd a soft whisper. "I'm behind you....hahahahaha.....". Frostflare then quickly turned around to see herself, not just normal frostflare though, the frostflare she feared to be. She examined it closely. 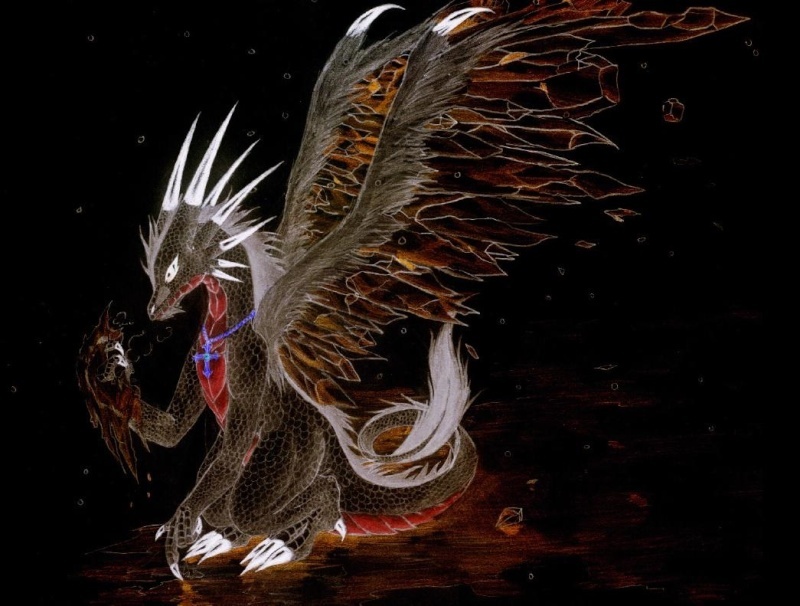 She had a large mouth with pionted teeth, and the crystals on her wings were stained red from blood, along with a white-ish scales on her paws. A black aura surrounded this dragon, and she was not wearing the cross necklace. Frostflare yelled. "WHO ARE YOU! TELL ME NOW OR I'LL RIP YOU TO SHREDS!" The voice the giggled and spoke once again. "I would like to see you try...." Enraged, frostflare flew up into the air and leaped onto the figure. She passed through a mirror and snaped its leg in her mouth, and carried it with her. When she turned around, she saw the voice laughing. "That's cute. You think you can beat me. Go ahead and look at yourself. Also, by the way, now you are the mirror of me." Frostflare was quick to notice that the dragon had no wounds, but a leg in its mouth. She looked down at her fore paws to see that her lag was missing. Frostflare immidiatly dropped to the ground. Frostflare's boby layed limp on the snow, until something strage happened. Her lag vanished, as a huge hole was left there to bleed. Constantly losing blood, she had to realize that this was not a dream. That this expirence is reality. SnowFall said soothly to Frostflare, "Frost, true you did kill two not yet borned hatchlings. But, remember that they are not yet borned. It still not okay, but it's better than murdering two well-borned hatchlings." She looked at her friend. She seemed not to be listening. Instead, Frost seemed to be dazing off and losing concious. Within seconds, she was lying on the snow, bleeding with no appraent reason. Snow glided down next to her and Blizzard arrived at that time. She was worried, "I don't know Blizz. She fainted without a reason." Snow bit her lip. She had no idea what to do. "Hurry, do we have a healer? We need to make sure that Frostflare is not sick or anything." She turned to Blizzard, "Blizzard, can you hurry back and get our healer? Tell her that it is urgent." Blizzard nodded towards Snow, he turned back towards the palace and took flight. Knowing that frost is in trouble he tried to get back as quickly as possible. Bursting back into the palace he shouted, "Solistice! I need Solistice." a few moments later he spotted her, dashing quickly by her side he blurted out, "Solistice, Frost is in trouble. She has fainted and there was blood. Come quickly!" Only a few seconds after he turned back towards the entrance ready to lead Solistice to Frost. He took flight and glided out of the doorway, glancing behind him to make sure Sol was keeping up. Solstice looked up, surprised. "What?!" She shrieked. She then looked down at her children, who looked concerned. "Remain calm, stay safe." The dragoness said clearly and glided after Blizzard. "Okay, where is it?! I can teleport there.. it'll be much quicker that way!" She cried and looked around frantically, making sure that she had well enough mana so she didn't have to weaken anyone. While gliding he turned to Sol, "Oh I sorry I forgot about your teleport , sure can you teleport me? Snow and frost where over by a small pond that way" he replied and pointed in the direction of the other dragons. He sighed and continued "I hope that Frost will be alright..." with a concerned look on his face. glancing back towards Sol, "I'am ready" he smiled. Solstice nodded and grabbed the closest part of Blizzard she could reach, which happened to be one of his wings. She teleported off with him, appearing just beside the other dragons. She looked around until she noticed Frost, and a large sob escape her maw. She rushed forward and then proceeded to sit down, mystified. "She's missing a leg.. and I don't see it.." The icy dragoness stated aloud. She crouched down and pursed her lips, blowing ice onto Frost's leg. This would heal and close the wound, as well as try and make the bleeding stop. She stared around and checked her other legs and stomach area, ensuring there were no other wounds. Solstice now had to awaken Frost, or bring her to a safe spot where she could rest. She decided on waking her up. Solstice shook her head and began to whisper "Wake up," in Frost's ear, while attempting to figure out a way to do it otherwise. Water? A slap? No. She just... had to rest. She was okay as long as her breath was steady. "We need to get her to a safe spot. She just needs rest. Does anyone have any idea how she lost her leg?" Solstice asked, staring around the group. Her leader wasn't injured... she was all good. Just.. tired? Right. That was Solstice's logic; her leader could never die, she would always return. Frostflare eventually regained her balance. She looked through the mirrow to see the other dragon. "Now its my turn to play." The voice muttered as it then stabbed it own eyes, then flew inwards towards the mirror, and pushing frost back out. She was blinded, and the last of things that she could see was just all red. She screamed in pain. Frostflare also noticed a taste of blood on her mouth. Her lips have been chewed at, so much that she could feel the bone. Frostflare charged forwards randomly and herd a poping sound. A shock of exrucating pain filled frostflare's chest as she then quickly got dizzy. The chest plate right above her heart had been torn off. She shouted to the other dragon. "I'LL MAKE YOU PAY! I'LL, I''L KILL YOU!" She screamed in pain. At this rate, frostflare wouldn't be able to survive for much longer, at this rat, frostflare could already been considered dead. Right in front of everybody's eyes, they saw frostflare's eye, lips, and chest vanish. blood poured down onto the snow. Her throat began to shrivvle as she quickly began to take what seemed like her final breaths. Life was quickly fading away from her, the only thing she could think about was what would happen. Suddenly, screams came out of the uncocous dragon's maw. The female dragoness started shaking in distress as she began to forget almost everything. The questions repeated over and over again in her mind all on top of each other. it was torcher. "Who am I? What am I living for? Who was I? Can I see? What will happen once I die? Will I die? Whats happening? Why os the world spinning? Is there a light after death? Whats happening to me? Am I dieing? Will I be able to survive? Why can't somebody help me?" Her head suddenly got hot, so hot that is was melting some snow around her. Solstice gasped. "WHAT IN THE WORLD IS HAPPENING HERE?!" She shrieked and then began to crouch beside Frost, attempting to patch up her wounds and cool her down. "Frost?!" She didn't even know what she was supposed to do. Sure, Solstice could take human bullets out, heal scars, scratches, deep wounds, stop bleeding, all of that jazz. But she couldn't reattach missing body parts- that she couldn't find. Solstice continued to do what she could, however, it wasn't enough. Blizzard watched with horror as Frost's injuries started becoming worse, "What could be causing this!?" he asked with a worried look. he sat next to sol seeing if he could be of any help. "I think we need to get wake up, this started as she fainted" something must be effecting Frost like she was dreaming. He had hoped that Sol had a method to awake her. SnowFall justed stared in horror as what was happening to Frost. "Wh..What's go..going on.. with.. her?" She stammered. She was starting to have tears in her eyes, "FROSTFLARE!!! STAY AWAKE!" She started to shout at her. Snow even gave a hard slap to her to wake Frost from the dream. She hoped it would work. Snow crouched down at her little brother Blizz and was starting to become afraid of what Frost is now. She was missing one eye, her lips, and her whole facial expression was starting to fade. Solstice looked at Snow as she slapped Frost. "I don't think that will help her injuries!" She cried and then thought quickly. She could do this... they were right. It was because of her sleeping. It had to be. Nothing could cause limbs disappearing randomly, except for maybe an invisible dragon. Or another god. But that wasn't possible. She crouched down and began poking at Frost, screaming "WAKE UP!" and spraying ice at her.